AAAI-11 AI Video Competition Submission Deadline Extended to June 17, 2011! AAAI solicits submissions for the fifth annual video competition! Its goal is to show the world how much fun AI is by documenting exciting artificial intelligence advances in research, education, and application. The rules are simple: Compose a short video about an exciting AI project, and narrate it so that it is accessible to a broad online audience. The developers of award-winning videos will be presented with Oscarlike trophies ("Shakeys," in honor of SRI's Shakey robot and its pioneering video) in a ceremony to he held at AAAI-11. We strongly encourage student participation. So go ahead and make a cool, online video about your AI project, and get a ton of attention! Submit your video by placing it at a publicly-accessible www site and notifying the Video Competition cochair, Arnav Jhala (jhala@soe.ucsc.edu), by e-mail (with the subject line AAAI Video Competition Submission). You are also asked to complete a submission form. All developers of nominated videos will be asked to sign a distribution license form. Videos must not contain any copyrighted video, audio, or characters. Degree of excitement: Entertainment value, enticing, novelty, and so on. 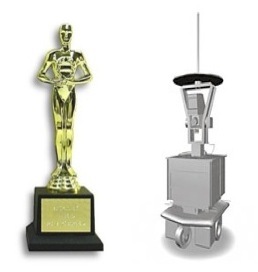 Awards will be trophies named in honor of SRI's Shakey robot and its inspirational video. For more Information contact David Aha (david.aha@nrl.navy.mil) or Arnav Jhala (jhala@soe.ucsc.edu). For complete instructions about the submission and review process, please visit the supplementary AI Video website (www.aivideo.org).